Shaving can be a tedious and puzzling task given the wrong shaver. You need to go over the same areas more than once and even then; there are still some hairs that are relentlessly left behind. In the hope of ending all your pain and suffering, I have done a review of the Braun Series 7 shaver. A German-based shaver that incorporates an intelligent autosensing technology with sonic technology for a powerful and seamless shave. Electric shavers have become a grooming stable over the years. However, while many do the job pretty well, the Braun Series 7 shaver packs a mighty number of features to help you achieve that perfect Brad Pitt look. Being an iconic German brand, nothing escapes it. An intuitive design, auto sense technology, sonic technology, automated cleaning station and five personalized speed settings. It sure doesn’t get any better than this. In this Braun series 7 7865cc and Braun series 7 7865cc review I am going to break down all the witty features of the Series 7 as well as its upsides and drawbacks. It may not be the most intuitively designed electric shaver on the market, but the Braun Series 7 7865cc electric foil shaver stacks up pretty well in as far as its ergonomics go. It is plastic made and silver chromed and incorporates an ultramodern design that fuses function and form to create the best user experience. The Braun Series 7 electric shaver is conceived with a unique and intelligent auto sense technology that reads the thickness of the beard and adjusts the power accordingly. This way, you’ll not only have extra power when you need it but it’ll also save you the trouble of having to circle the same spot twice. Like most Braun shavers, the Braun 7 Series comes with a dynamic flexible head that provides maximum comfort and pressure sensitive blades that adapt to your skin and work together for a gentle, close shave. From having two cleaning options to a waterproof body, cleaning the Braun shaver series 7 could be as easy as manually running it under water or opting for the automated mode. Either way, you shouldn’t have any problems at all maintaining its sleek and sparkly outlook especially if you not only clean it but also sanitize, lubricate and dry it well. As part of the refreshed Series 7, the Braun Series 7 7865cc comes with five personalized settings that allow you to alter the speed to your liking. For instance, you can alter to lower speeds when shaving irritation prone areas such as your neck and turn to turbo when you’re done. As with all cc models, the 7865cc Braun Series 7 cleaning station comes with an automated charging and cleaning base that helps with cleaning. The station uses pretty much the same kind of cartridges as all other Braun cleaning solutions to take care of lubricating and cleaning the shaver for you. Great design and sturdy body. It’s great for sensitive skin. It is not affordable for most people. The Braun Series 7 replacement head and Braun series 7 replacement blades cost an arm and a leg to replace. The cleaning system is a bit too noisy. Who should buy the Braun Series 7 7865cc? While just about anyone can use the Braun Series 7 shaver, I would highly recommend it for persons who have sensitive skin and long thick hair. The Braun Series 7 7865cc comes highly rated with most of the remarks stating how good of an investment it is. For most people, most of the excitement emanates from being able to use it on basically all skin and beard types while some of it can be attributed to its impeccable performance. As a matter of fact, many people who were long-term users of other products eventually made a switch. Since the unveiling of Braun series 9, there’s been quite a dilemma in the electric shaving community. Should you still pick the Braun series 7 shaver or the Braun series 9 shaver? While there are many factors to consider when choosing a suitable shaver, performance is probably one of the most important. So, I’ll break the debate down by looking at three major aspects. For quite some time now, the series 7 has been the benchmark in terms of comfort. It has micro-pulsations that make shaving feel like a soft and gentle massage and an amazing coolness that further increases the comfort of the shave. What’s more, it has about 3-5 speed settings that allow you to alter the speed from high to low or vice versa. With the Series 9, Braun took the comfort a notch higher but got rid of the speed settings. 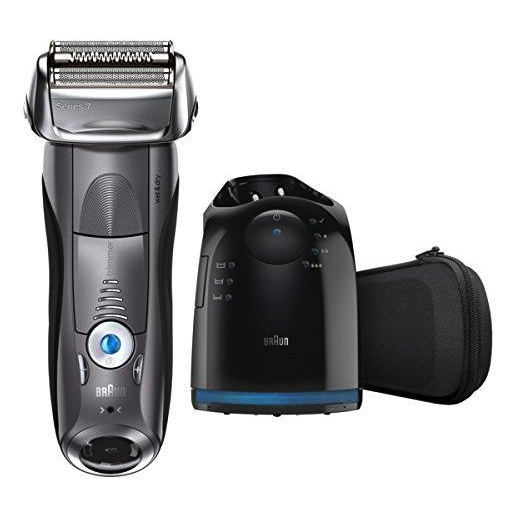 It has an improved design coupled with a more powerful motor to provide an outstanding shaving experience. As for its foils, well they remain cool during use as well as provide a forgiving and comfortable experience. Generally, I can say that the Series 9 pretty much bags the lead in as far as comfort goes. However, the margin is quite small since the Series 7 was already an excellent shaver. From having exceptionally sharp blades and a specially designed middle trimmer, you could say that series 7 stacks up well and is quite capable of providing a close and smooth shave. And while the series 9 is equally as good, the two have a negligible difference with the series 9 having a slight advantage. Not to mention it’s both faster and easier to get a shave using the series 9. Being practically an upgrade of the 7 series with more cutting elements and plenty of power, the 9-series shaves any kind of beard both effortlessly and fast. As for the flexing capabilities, the 9-series movement of the swiveling and cutting elements of the shaving head are buttery smooth and ensure constant contact with the skin. Braun’s implementation of specialized elements that capture long. flat hairs that grow in various directions also adds to the 9-series superiority. The Braun Series 9 stacks up pretty well in terms of performance. Although for a long time the Braun Series 7 has been widely regarded as the benchmark of comfort and peace, the latest iteration of Series 5 will have you confused over which model to go for. While the Braun Series 7 vs Series 5 is multifaceted in nature, there are some integral aspects that should be considered when trying to decide between the two. Worried? Don’t be! I will try to present it as objectively as I possibly can and hopefully, from my analysis, you’ll be better placed to decide on which one would be a better fit for you. Both the Series 7 and series 5 shavers use similar shaving heads comprised of a middle trimmer that lifts long flat hairs and cuts them and two foils for cutting hair close to the skin. The first difference as in regard to comfort and closeness is the Sonic technology found on most 7 series shavers. According to Braun, the 7 series makes about 10,000 micropulsations per minute that make the foils vibrate and lift the hairs for a more enjoyable and efficient shave. Nonetheless, the difference is negligible between the 7 series and the 5 series in as far as comfort and closeness go. The 7 series features a personalization mode that allows you to choose from about 5 settings. All you have to do is press the two buttons located below the power button and you’re good to go. However, in practice, this makes no real difference at all. If you were to use both the series 7 and series 5, the results will be similar with the only difference being how you get those results. There is a superfluity of Braun series 7 variations currently available and deciding which one to buy can be a tedious if not frustrating affair. How about we do a little comparison to help you narrow down your options? Based on shaving performance, all Braun Series 7 shavers are equal. They all have an advanced sonic technology that gives you the ability to personalize your shave so as to achieve that perfect seamless individual shave. What’s more, they are a great option for a man with sensitive skin and provide unmatched comfort and robust build quality. Apart from that, they are also able to stand the test of time hence their iconic status. Nonetheless, there are a few differences between the series 7 7865 and the series 7 740s, 790cc and 760cc. For instance, the 760cc, 740s, and 790cc all have 3-speed setting whereas the 7 7865cc has 5-speed setting. As for use, the 7 77865cc, 760cc, and 740s are wet and dry shavers. The 7 790cc however, is a dry shaver only. So, depending on your preference, you can opt for either of them. On the flipside, however, unlike with wet/dry shaver, the 790cc doesn’t have the limitation of not being used while plugged in. As for price, the 740s is priced much lower than the 790cc, 7865cc, and 760cc which makes it highly affordable. Basically, all these devices stack up well in as far as performance goes. However, the Series 7 7865cc has some minor iterations that make it the best Braun shaver for your needs. And there you have it! The complete and comprehensive Braun series 7 review. Basically, the Braun Series 7 7865cc is an incredible device with lots of tricks up its sleeve. I would recommend it because it’s as good for someone who just wants to tidy up as it is for someone who wants to achieve that perfect Brad Pitt look.